The luminosity distance – redshift relation is analytically given for generalized Randall-Sundrum type II brane-world models containing Weyl fluid either as dark radiation or as a radiation field from the brane. The derived expressions contain both elementary functions and elliptic integrals of the first and second kind. First we derive the relation for models with the Randall-Sundrum fine-tuning. Then we generalize the method for models with cosmological constant. The most interesting models contain small amounts of Weyl fluid, expected to be in good accordance with supernova data. The derived analytical results are suitable for testing brane-world models with Weyl fluid when future supernova data at higher redshifts will be available. At present the Universe is considered a general relativistic Friedmann space-time with flat spatial sections, containing more than 70% dark energy and at about 25% of dark matter. Dark energy could be simply a cosmological constant Λ, or quintessence or something entirely different. There is no widely accepted explanations for the nature of any of the dark matter or dark energy (even the existence of the cosmological constant remains unexplained). An alternative to introducing dark matter would be to modify the law of gravitation, like in MOND [1–3] and its relativistic generalization [4, 5]. These theories are compatible with the Large scale structure of the Universe [6–8]. However in spite of the successes, certain problems were signaled on smaller scales [9–13]. Quite remarkably, supernova data, which in the traditional interpretation yield to the existence of dark energy, can be explained by certain f(R) [14, 15] or inverse curvature gravity models . However the parameter range, in which the latter is in goood agrement with the supernova data, also presents stability problems [17, 18]. Modifications of the gravitational interaction could also occur by enriching the space-time with extra dimensions. Originally pioneered by Kaluza and Klein, such theories contained compact extra dimensions. The so-called brane-world models, motivated by string/M-theory, containing our observable 4-dimensional universe (the brane) as a hypersurface, were introduced in [19–21] and , the latter model allowing for a non-compact extra dimension. In a cosmological context and suppressing any energy exchange between the brane and the bulk, this latter term generates the so-called dark radiation. Otherwise it can be called a Weyl fluid. A review of many aspects related to the theories described by the effective Einstein equation (2) can be found in . Both early cosmology  and gravitational collapse [27–32] are essentially modified in these theories. There is also possible to replace dark matter with geometric effects in the interpretation of galactic rotation curves, weak lensing and galaxy cluster dynamics [33–36]. The possible modifications of gravitational dynamics are even more versatile in the so-called induced gravity models. 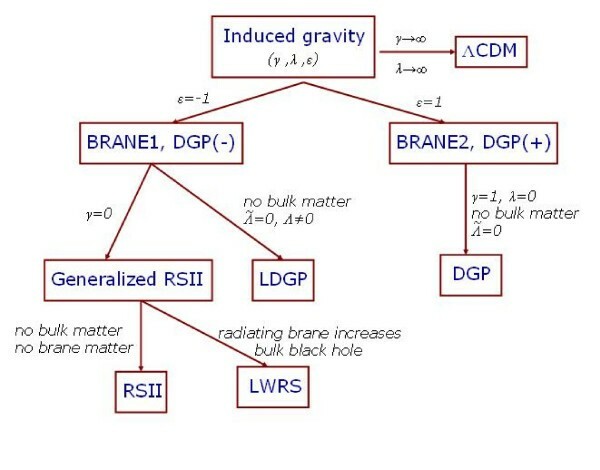 These can be regarded as brane-world models enhanced with the first quantum-correction arising from the interaction of the brane matter with bulk gravity. The induced gravity correction couples to the 5-dimensional Einstein-Hilbert action with the coupling constant γ κ ˜ 2 / κ 2 MathType@MTEF@5@5@+=feaafiart1ev1aaatCvAUfKttLearuWrP9MDH5MBPbIqV92AaeXatLxBI9gBaebbnrfifHhDYfgasaacH8akY=wiFfYdH8Gipec8Eeeu0xXdbba9frFj0=OqFfea0dXdd9vqai=hGuQ8kuc9pgc9s8qqaq=dirpe0xb9q8qiLsFr0=vr0=vr0dc8meaabaqaciaacaGaaeqabaqabeGadaaakeaaiiGacqWFZoWzcuWF6oWAgaacamaaCaaaleqabaGaeGOmaidaaOGaei4la8Iae8NUdS2aaWbaaSqabeaacqaIYaGmaaaaaa@34F1@ . The simplest of such models, the DGP model was introduced in . This model however suffers from linear instabilities (ghost modes in the perturbations), as shown for de Sitter branes [38–40]. The ghost modes withstand even the introduction of a second brane . Generalizations of the DGP model are discussed covariantly in  and  when the embedding is symmetric, and in  when it is asymmetric. In these models the role of the effective Einstein equation (2) is taken by a more complicated equation (see for example Eq. (29) of ), which contains the square of the Einstein tensor G ab . This implies that in certain sense the degree of nonlinearity of the theory is squared. In a cosmological setup the square root of this equation can be taken, leading to a set of modified Friedmann and Raychaudhuri equations, which however contain a sign ambiguity ε = ±1 due to the involved square root. These are called the BRANE1 [DGP(-)] branch for ε = -1 and BRANE2 [DGP(+)] for ε = 1 in the terminology of  [or , respectively]. Both the original Randall-Sundrum type II model and the DGP model are contained as special subcases. Notably, the BRANE2 branch contains cosmological models which self-accelerate at late-times. We give in Fig 1 a diagram containing a classification of these theories and how they emerge as different limits from each other. A diagram presenting various brane-world models and their inter-relations. LWRS is the generalized Randall-Sundrum model with cosmological constant and a Weyl fluid reflecting a brane radiating into the bulk during nowadays or at least until recent cosmological times. In this paper we discuss analytically the luminosity distance – redshift relation in various generalized Randall-Sundrum type II brane-world models described by Eq. (2). Our analytical approach can enhance the confrontation of these models with current and most notably, with future supernova observations. We note that recently analytical results have been given in Ref. for a wide class of phantom Friedmann cosmologies too, in terms of elementary and Weierstrass elliptic functions. In section 2 we review the notion of luminosity distance, its relation with the redshift and how these can be measured independently. This section was included mainly for didactical purposes. In section 3 we review the modification of this relation in the Randall-Sundrum type II brane-world scenario. These include the introduction of the parameters Ω λ and Ω d which can be traced back to the source terms S ab and ℰ a b MathType@MTEF@5@5@+=feaafiart1ev1aaatCvAUfKttLearuWrP9MDH5MBPbIqV92AaeXatLxBI9gBaebbnrfifHhDYfgasaacH8akY=wiFfYdH8Gipec8Eeeu0xXdbba9frFj0=OqFfea0dXdd9vqai=hGuQ8kuc9pgc9s8qqaq=dirpe0xb9q8qiLsFr0=vr0=vr0dc8meaabaqaciaacaGaaeqabaqabeGadaaakeaat0uy0HwzTfgDPnwy1egaryqtHrhAL1wy0L2yHvdaiqaacqWFWesrdaWgaaWcbaGaemyyaeMaemOyaigabeaaaaa@3A48@ of the modified Einstein equation (2). The other cosmological parameters are Ω ρ , representing (baryonic and dark) matter and ΩΛ. We do not include bulk sources in the analysis, with the notable exception of a bulk cosmological constant. Section 4 contains the derivation of the analytic expression for the luminosity distance – redshift relation for the brane-worlds which are closest to the original Randall-Sundrum scenario , thus with no cosmological constant (Randall-Sundrum fine-tuning). The generic expression (35) of the luminosity distance derived here is given in terms of elementary functions and elliptic integrals of the first and second kind. From this most generic case we take the subsequent limits: Ω d = 0 (subsection 4.2), Ω λ = 0 (subsection 4.3); and both Ω d = Ω λ = 0, this being the general relativistic Einstein-de Sitter case (subsection 4.4). Such models however could not allow for late-time acceleration, therefore in section 5 we discuss the luminosity distance – redshift relation for brane-worlds with Λ. First we present in subsection 5.1 a class of models, for which the luminosity distance can be given in terms of elementary functions alone. These models are characterized by an extremely low value of the brane tension, thus are in conflict with various constraints on brane-world models. Next, in subsection 5.2 we discuss brane-worlds for which the brane-characteristic contributions Ω λ and Ω d represent small perturbations. This is a good assumption as observational evidences suggest that general relativity is a sufficiently accurate theory of the universe, and as such the deviations from it could not be very high, at least at late-times. We give analytical expressions in terms of both elementary functions and elliptic integrals of the first and second kind for the luminosity distance, to first order accuracy in the chosen small parameters of the model. Some of the most lengthy computations needed in order to achieve the result are presented in the Appendix. Section 6 contains the concluding remarks. Throughout the paper c = 1 was employed. χ being an other comoving radial coordinate. of a photon stream is constant in time. Here ω denotes the frequency of the photons, dA and dΩ stand for the elementary area normal to the direction of propagation and for the elementary solid angle around the direction of propagation, respectively (see Fig 2). Eq. (9) holds true for any kind of cosmological evolution, provided d3 x → MathType@MTEF@5@5@+=feaafiart1ev1aaatCvAUfKttLearuWrP9MDH5MBPbIqV92AaeXatLxBI9gBaebbnrfifHhDYfgasaacH8akY=wiFfYdH8Gipec8Eeeu0xXdbba9frFj0=OqFfea0dXdd9vqai=hGuQ8kuc9pgc9s8qqaq=dirpe0xb9q8qiLsFr0=vr0=vr0dc8meaabaqaciaacaGaaeqabaqabeGadaaakeaacuWG4baEgaWcaaaa@2E37@ ∝ dτdA and d3 p → MathType@MTEF@5@5@+=feaafiart1ev1aaatCvAUfKttLearuWrP9MDH5MBPbIqV92AaeXatLxBI9gBaebbnrfifHhDYfgasaacH8akY=wiFfYdH8Gipec8Eeeu0xXdbba9frFj0=OqFfea0dXdd9vqai=hGuQ8kuc9pgc9s8qqaq=dirpe0xb9q8qiLsFr0=vr0=vr0dc8meaabaqaciaacaGaaeqabaqabeGadaaakeaacuWGWbaCgaWcaaaa@2E27@ ∝ ω2dωdΩ are valid for the photons . The luminosity of the source is = dE em /dt em (total energy produced in unit time; the suffix em refers to emission). 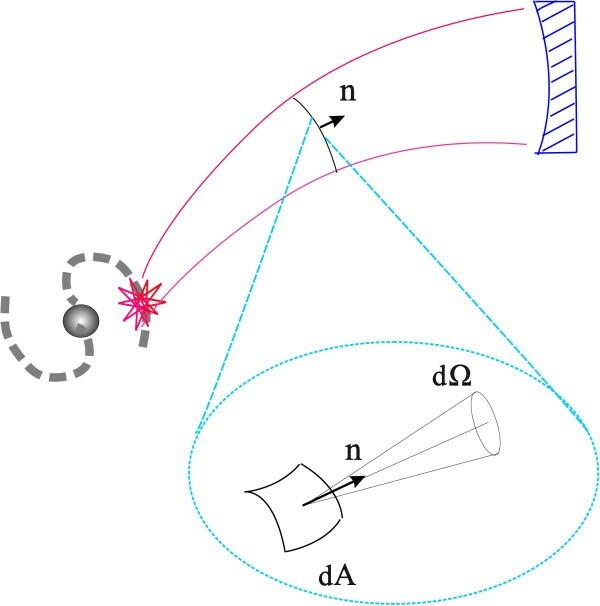 A schematic representation of the propagation in the curved space-time of the light emitted by a supernova explosion in a distant galaxy and collected on the telescope mirror. A dimensional magnification (à la Wheeler) shows the elementary area dA normal to the direction of propagation n and the elementary solid angle dΩ around n.
Here we have used that from the isotropy of the FLRW universe dΩ rec = dΩ em and we integrate the first to the solid angle encompassing the mirror surface, the second to the whole solid angle (cf. the definitions of E rec , E em ). In Eq. (11) A tot represents the proper area of a sphere centered in the light source and containing the reception point on its surface, at the time of reception. This definition is rigorous as long as we are dealing with the (homogeneous and isotropic) FLRW universe (irrespective of the value of the curvature index k) and the radius of a sphere is measured in the proper distance ra (the FLRW metric (6) guarantees that the surface of a sphere with radius ra is 4πa2r2). d L (z) ≡ a0 (1 + z) (χ em ; k). which completes the definition (15) of the luminosity distance d L in terms of the redshift z.
therefore if independent measurements of d L and z are available for a set of light sources, the Hubble-parameter H(z) and in consequence the cosmological dynamics can be determined. In practice, the function d L (z) is conveniently measured with distant supernovae of type Ia. The luminosity is evaluated by photometry, while the redshift from spectroscopic analysis of the host galaxy. Each cosmological model has its own prediction for the shape of the function d L (z) [see Eq. (15) with χ given by Eq. (17) for generic k, or Eq. (19) for k = 0]. This is how the measured d L (z) data turn into a cosmological test. This is a complicated integral, which cannot be computed analytically in the majority of cases. In what follows we will analyze various specific cases of the above integral, when an analytic solution is possible. The cases α = 2, 3 represent the Weyl fluid compatible with structure formation, while α = 0 represents the dark radiation. In the original Randall-Sundrum scenario the bulk cosmological constant Λ ˜ MathType@MTEF@5@5@+=feaafiart1ev1aaatCvAUfKttLearuWrP9MDH5MBPbIqV92AaeXatLxBI9gBaebbnrfifHhDYfgasaacH8akY=wiFfYdH8Gipec8Eeeu0xXdbba9frFj0=OqFfea0dXdd9vqai=hGuQ8kuc9pgc9s8qqaq=dirpe0xb9q8qiLsFr0=vr0=vr0dc8meaabaqaciaacaGaaeqabaqabeGadaaakeaacuqHBoatgaacaaaa@2E30@ is fine-tuned with the brane tension λ such that cf. Eq. (20) the brane cosmological constant vanishes. For simplicity we also assume throughout this section α = 0. By imposing a vanishing cosmological constant on the brane, ΩΛ = 0 such that the polynomial of rank 6 in the denominator of the integrand in Eq. (27) shrinks to a polynomial of rank 3. Therefore its roots can be found analytically. Following general procedures, the luminosity distance – redshift relation can be then given analytically in terms of elliptic functions. This is done in the following subsection. In the second and third subsections of this chapter we discuss the limits Ω d → 0 (when the bulk is anti de Sitter) and the late-time universe limit ρ/λ → 0. The general relativistic (Einstein-deSitter) limit is found in the fourth subsection, when further Ω λ → 0 is taken. where K and E are the complete elliptic integrals of the first and second kind. Eqs. (30) and (35)–(37) represent the analytical expression of the luminosity distance-redshift relation for FLRW branes with Randall-Sundrum fine-tuning. They are given in terms of the well-known elliptic integrals of first and second kind, and the cosmological parameters Ω ρ , Ω λ and Ω d .
Again, ϕfor this case emerges in the limit Ω d → 0 from the generic expression Eq. (37), by employing Eq. (41) as in the limiting process expressions of the type ∞ × 0 appear. B2 = 1 = -B1. By inserting the values ϕ em = ϕ(z) and ϕ0 = ϕ(0), we recover the luminosity distance – redshift relation (44). It is straightforward to check that the above result stems out from Eq. (44) by simply switching off the dark radiation. Adding everything together, we recover the general relativistic result (48). In this section we discuss certain cases of Randall-Sundrum type brane-worlds with cosmological constant, for which analytical expressions for the luminosity-redshift relation can be found. with h = (Ω ρ /2ΩΛ)1/3. corresponding to the brane tension λ2 = 1.4173 × 10-60TeV4. It is interesting to note that while solution (55) is ruled out by the recent supernova data, solution (54) is quite close to the present observational value of ΩΛ . From a brane point of view, however the value of the brane tension in the model (54) is far too small, thus it does not describe our physical world. Indeed, all lower limits set for λ are much higher than λ2. In the two-brane model of Ref. the minimal brane tension depends on the value of the Planck mass M P and on the characteristic curvature scale of the bulk l as λ min = 3 M P 2 / 4 π l 2 MathType@MTEF@5@5@+=feaafiart1ev1aaatCvAUfKttLearuWrP9MDH5MBPbIqV92AaeXatLxBI9gBaebbnrfifHhDYfgasaacH8akY=wiFfYdH8Gipec8Eeeu0xXdbba9frFj0=OqFfea0dXdd9vqai=hGuQ8kuc9pgc9s8qqaq=dirpe0xb9q8qiLsFr0=vr0=vr0dc8meaabaqaciaacaGaaeqabaqabeGadaaakeaaiiGacqWF7oaBdaWgaaWcbaGagiyBa0MaeiyAaKMaeiOBa4gabeaakiabg2da9iabiodaZiabd2eannaaDaaaleaacqWGqbauaeaacqaIYaGmaaGccqGGVaWlcqaI0aancqWFapaCcqWGSbaBdaahaaWcbeqaaiabikdaYaaaaaa@3E42@ . Table-top experiments [56–58] on possible deviations from Newton's law currently probe gravity at sub-millimeter scales. As a result they constrain the characteristic curvature scale of the bulk to l ≤ 44 μm. The brane tension therefore (in units c = 1 = ħ) is constrained as λ > 715.887 TeV4. (For a detailed discussion see section 6 of , where a slightly lower bound for the brane tension was derived, based on the previously available estimate l ≤ 0.1 mm for the characteristic curvature scale of the bulk.) Big Bang Nucleosynthesis constraints give a much milder lower limit, λ ≳ 1 MeV4 . An astrophysical limit λ > 5 × 108 MeV4 (depending on the equation of state of a neutron star) has also been derived . This latter value of λmin is in between the two previous lower limits. The interpretation of the model (54) is the following. The condition (53) on the models with small brane tension implies Λ ˜ MathType@MTEF@5@5@+=feaafiart1ev1aaatCvAUfKttLearuWrP9MDH5MBPbIqV92AaeXatLxBI9gBaebbnrfifHhDYfgasaacH8akY=wiFfYdH8Gipec8Eeeu0xXdbba9frFj0=OqFfea0dXdd9vqai=hGuQ8kuc9pgc9s8qqaq=dirpe0xb9q8qiLsFr0=vr0=vr0dc8meaabaqaciaacaGaaeqabaqabeGadaaakeaacuqHBoatgaacaaaa@2E30@ = 0, thus the bulk becomes flat. As such, it has no effect on dynamics and the fifth dimension becomes superfluous. In fact what we face here is a GR model with stiff fluid scaling as a-6. The first expression is the general relativistic luminosity distance – redshift relation in the presence of a cosmological constant (in the ΛCDM model). The next two integrals represent the correction functions scaling the small coefficients Ω λ and Ω d .
with the variable ϕ and argument ε given in Eq. (61). I d ( 3 ) = − ( 1 + z ) 3 H 0 Ω ρ [ 1 Ω Λ + Ω ρ − 1 ( 1 + z ) Ω Λ + ( 1 + z ) 3 Ω ρ ] + 2 ( 1 + z ) 3 H 0 Ω Λ 5 / 6 Ω ρ 2 / 3 I d ( ϕ , ε ) . Thus, the analytic expression of the generic luminosity distance – redshift relation on branes with cosmological constant and small values of Ω λ and Ω d is given to first order accuracy in these small parameters by Eqs. (56), (60), (63)–(67). (a) Models with Randall-Sundrum fine-tuning (Λ = 0), with or without dark radiation from the bulk and with or without considerable contribution from the energy-momentum squared source terms, discussed in section 4. (c) Models with a brane cosmological constant, discussed to first order accuracy in both the Weyl fluid and energy-momentum squared sources. This last class of models, presented in subsection 5.2 in the latest times of the cosmological evolution are only slightly different from the Λ CDM model, as they have Ω d ≪ 1 and Ω λ ≪ 1. The derived modifications in the luminosity distance – redshift formula then represent corrections to the corresponding formula of the ΛCDM model. While the focus of the present paper is the integrability of the luminosity distance – redshift relation in various brane-world models, in a forthcoming paper  we will discuss how well the presently available supernova data support the brane-world models with a small amount of Weyl fluid. I d ( 3 ) = − ( 1 + z ) a 0 2 3 H 0 Ω Λ 3 / 2 ∫ a 3 / 2 a 0 3 / 2 t 2 / 3 d t [ t 2 + Ω ρ a 0 3 Ω Λ ] 3 / 2 = − ( 1 + z ) Ω Λ 1 / 2 3 H 0 a 0 Ω Λ 1 / 2 Ω ρ [ t 2 t 1 / 3 t 2 + Ω ρ a 0 3 Ω Λ ] a 3 / 2 a 0 3 / 2 + 2 ( 1 + z ) 9 H 0 a 0 Ω Λ 1 / 2 Ω ρ ∫ a 3 / 2 a 0 3 / 2 t 2 / 3 d t t 2 + Ω ρ a 0 3 Ω Λ . Here I d (ϕ, ε) is given by Eqs. (67). ‡ All values of the brane tension given in this subsection are in units c = 1 = ħ. This work was supported by OTKA grants no. T046939, 69036 and T042509. L ÁG and GyMSz were further supported by the János Bolyai Grant of the Hungarian Academy of Sciences and GyMSz by the Magyary Zoltán Higher Educational Public Foundation.